MONROE, James (1758-1831) was an American statesman and Founding Father who served as the fifth President of the United States from 1817 to 1825. Monroe was the last president of the Virginia dynasty, and his presidency ushered in what is known as the Era of Good Feelings. Born in Westmoreland County, Virginia, Monroe was of the planter class and fought in the American Revolutionary War. He was wounded in the Battle of Trenton with a musket ball to the shoulder. After studying law under Thomas Jefferson from 1780 to 1783, he served as a delegate in the Continental Congress. 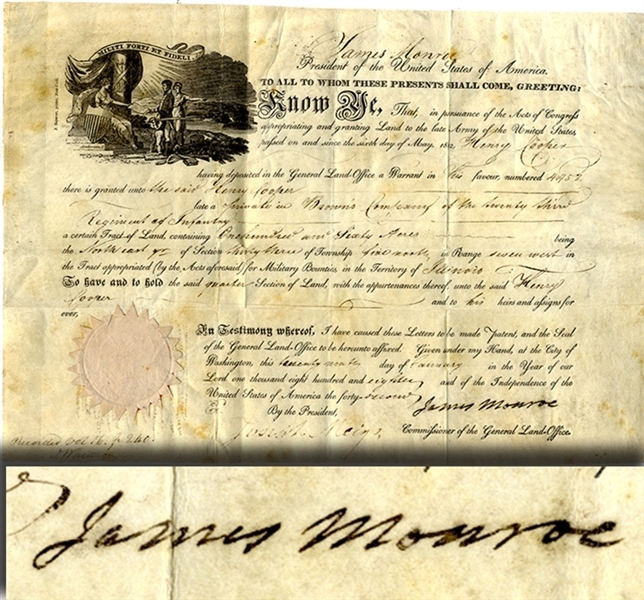 Document Signed “James Monroe” as President of the United States, 1pp. oblong folio, vellum, January 29, 1808, being a land grant of Henry Cooper “a private in Brown’s Company of the Seventy Third Regiment of Infantry.” Fine condition.